The legal side of affiliate marketing - what should you know? Receiving commission if someone uses your affiliate link. Receiving a product or compensation in exchange for writing a post on your blog or on your social media (sponsored content). 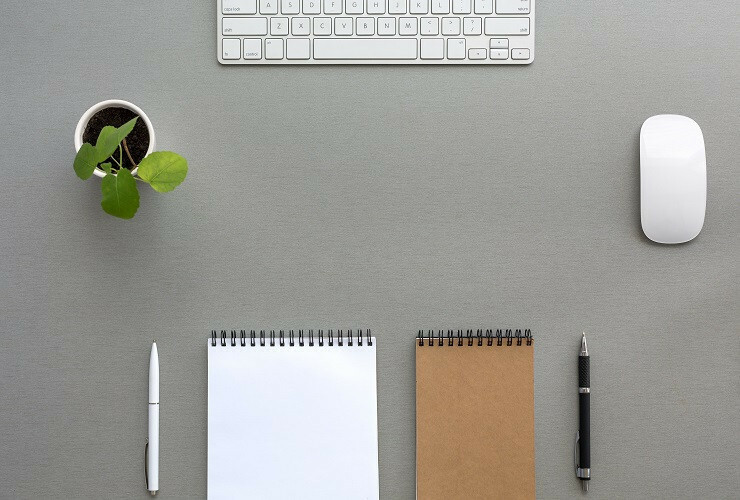 For those of you not familiar with affiliate marketing, you may want to start by reading our post about The Basics for Affiliate Marketing in which we explain the terminology, how affiliate marketing works, and some statistics for understanding the ecosystem. You may also want to check out The Complete Beginners’ Guide to Affiliate Marketing. 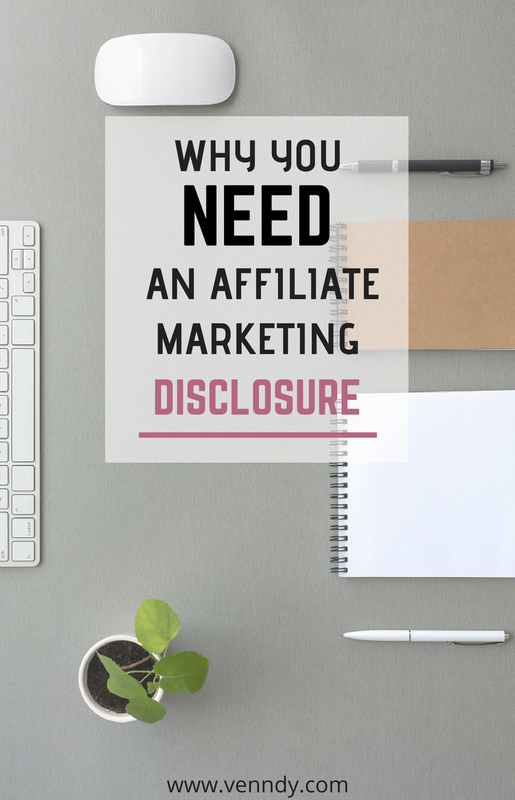 Why is an affiliate disclosure needed? The FTC regulations are meant to protect consumers from ads, testimonials and endorsement being deceptive or unclear and disclose any relationship that may have influenced an opinion or a review. The rational is to keep transparency and encourage honest and genuine experience shared. When someone is being paid (in any form of compensation) for the content and review written, that could influence their judgement and honest opinion. Since they are influencing people’s buying decisions, transparency should let consumers know about your monetary compensation, so they can have a full picture on your relationship with the brand you’re promoting. However, you should not let your fear of losing readers stop you from the potential of making money blogging. Being upfront and honest with your readers is part of building your long-term credibility and trustworthy relationships. 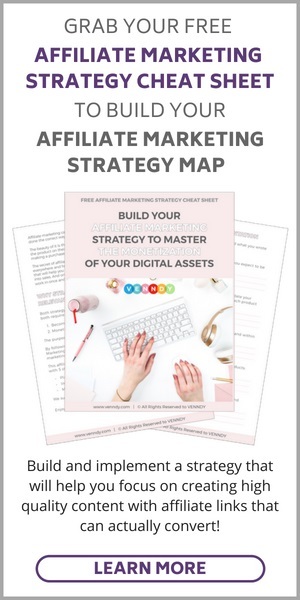 You may want to read more about How To Make Affiliate Marketing Work and Succeed as an Affiliate in Any Niche in our other Affiliate Marketing Guides. An affiliate disclosure is a statement that lets your readers or followers know when affiliate links are being used on your blog or on any other platform. This statement should let your readers know that you have something to gain from recommending a certain product or brand, so that they can get a full overview of what your intentions might be. It’s only ethical to let your readers know that when they purchase something through your links, you get awarded a commission for that purchase. This post is only a summary of some of the guidelines set by the FTC and you are advised to seek and obtain your own legal advice on how these rules apply to your website or other promotional activities for which you receive compensation. What does the compliance with FTC Endorsement Guidelines include? 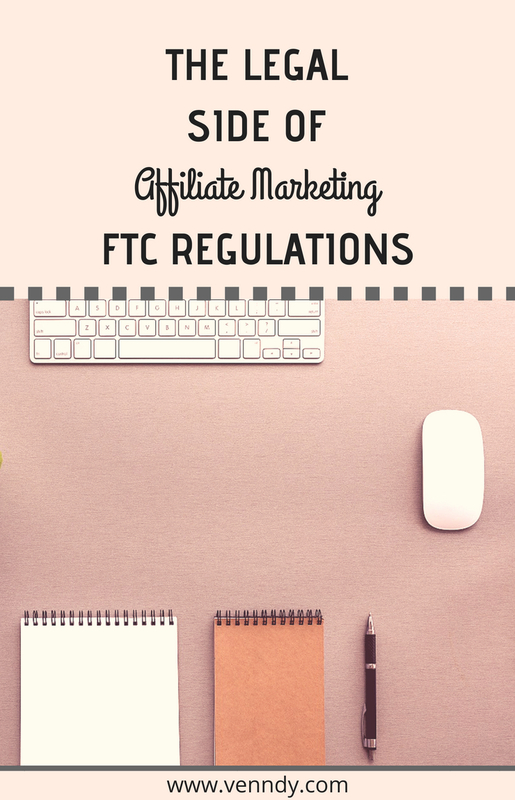 The FTC requires disclosure of any material connection or relationship you have with a merchant/advertiser when you endorse or promote a product or service to your readers. Affiliate links are considered such a material connection. This means that directories, reviews, blogs and other websites or emails that purport to provide an endorsement or assessment of an advertiser must prominently disclose the fact financial, or in- kind compensation, is provided from the advertiser. That you will disclose your affiliate relationship with the applicable affiliate network or program/advertiser when discussing such advertiser or its products, directly or indirectly. 1. Disclosure should be frequent – Placing one disclosure on your home page or a link to one in your footer is not enough. Disclosures must be on every page of your site that has a review, recommendation, comment or article that promotes a product for which you receive any form of compensation. 2. Disclosure should be clear – The disclosure must make it clear right away to the reader that you are compensated for your review. You may include other information in your disclosure, such as whether you personally tested the product or that your review is honest, but you must disclose compensation first (at the beginning) and clearly. It should not be hidden in legalese. 4. Disclosure should require no action – Your disclosure must be immediately visible to anyone who visits your reviews or endorsements. The visitor should not be required to take any action to view it. Such actions include: Scrolling (your disclosure must appear "above the fold,” meaning the visitor does not have to scroll down to see it) or clicking (visitors should not have to click a link to view your disclosure). 1. Prominence – Is the disclosure big enough for consumers to read easily? Disclosures must be in a font of the same size as the rest of your post. Use big enough fonts that users can easily read and consider contrast, too. White text on a light or variegated background isn’t likely to be noticed. Nor will a fine-print statement that has to compete with a dynamic and distracting image. 2. Presentation – Is the disclosure worded in a way that consumers can easily understand? Using legalese or technical terminology reduces the likelihood that consumers will get the message. Disclosures must be obvious, not buried in a long paragraph of unrelated text or hashtags. 3. Placement – Is the disclosure where consumers are likely to look? The disclosures must be next to the content to which it relates to; a viewer should not need to scroll to view the disclosure or only be accessible by clicking a link (referring to your disclaimer, about me or bio pages). The bottom of the page or screen isn’t a place most consumers will look. 4. Proximity – Is the disclosure close to the claim it modifies? Make sure the disclosure is not distant from the prominent headline. How to phrase your affiliate disclosure on your blog and social media? Disclosure on a blog post should specifically state that you get commission for purchases or clicks made through links in this post. Types of Disclosures for affiliate links used in social media posts can include: #ad, #CommissionLink, #affiliatelink. For sponsored posts it can be: #sponsored, #advertising. * Please note that if the post is sponsored, it should also include the sponsors name. * If you have further questions about how to comply legally, you may want to check the What People Are Asking Guide released by the FTC to read more information. * And again, this post is only meant to bring to your attention some of the requirements by the FTC. You should seek and obtain your own legal advice on how these rules apply to your website or other promotional activities for which you receive compensation.